Eric Meyer (19 points) hit 9-of-10 free throws in the final quarter. 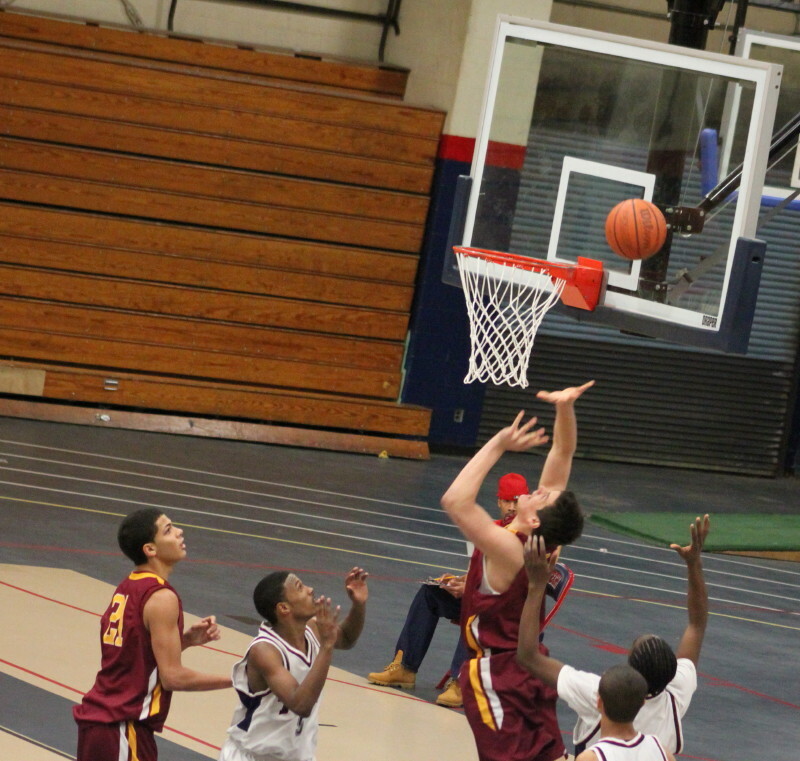 Rich Warren (37 points) hit two 3’s in the last minute. (Lynn) Newburyport took a seven point lead with 1:12 left and made enough pressure free throws after that to offset a couple of Rich Warren 3’s and defeated Lynn Tech, 74-71, in Lynn on Thursday night to advance to the Division 3 North semi-finals. Until Michael Duarte’s last-second heave from the backcourt fell short and the buzzer went off, there was no certainty of the winning team. 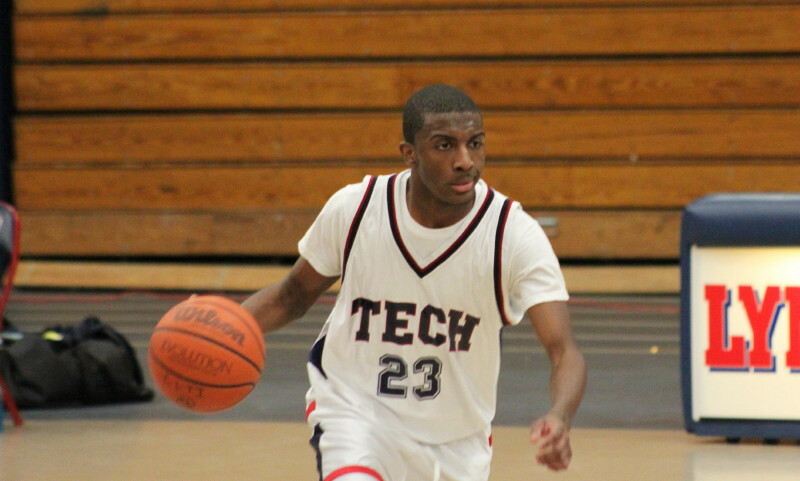 Lynn Tech’s Rich Warren (37 points) was awesome the entire game and the Clippers can be thankful that he wasn’t taking that last shot or we might have seen overtime. Because of the Clipper free throws, that last-second shot was the only chance in the last five minutes of the game where Lynn Tech had the ball and a chance to tie with a made three. On the road in front of a very loud Lynn Tech crowd, Newburyport made 13-of-16 free throws in the tense final quarter. Trailing by as many as seven, the Tigers were quick to foul after every missed shot and since Eric Meyer seemed to rebound every miss, he took most of the free throws. I don’t know how good a free throw shooter Eric was during the season but in the final quarter of a do-or-die game he was an amazing 9-for-10! The celebrating begins on the Newburyport sideline as the game ends. 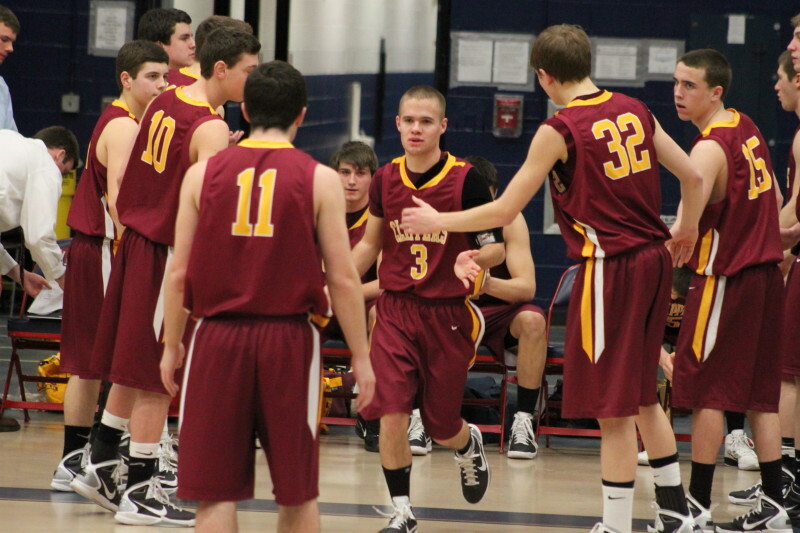 Eric’s last free throw gave Newburyport a 72-66 lead with twenty-three seconds left. Rich Warren cut that lead in half with his 6th 3-pointer. 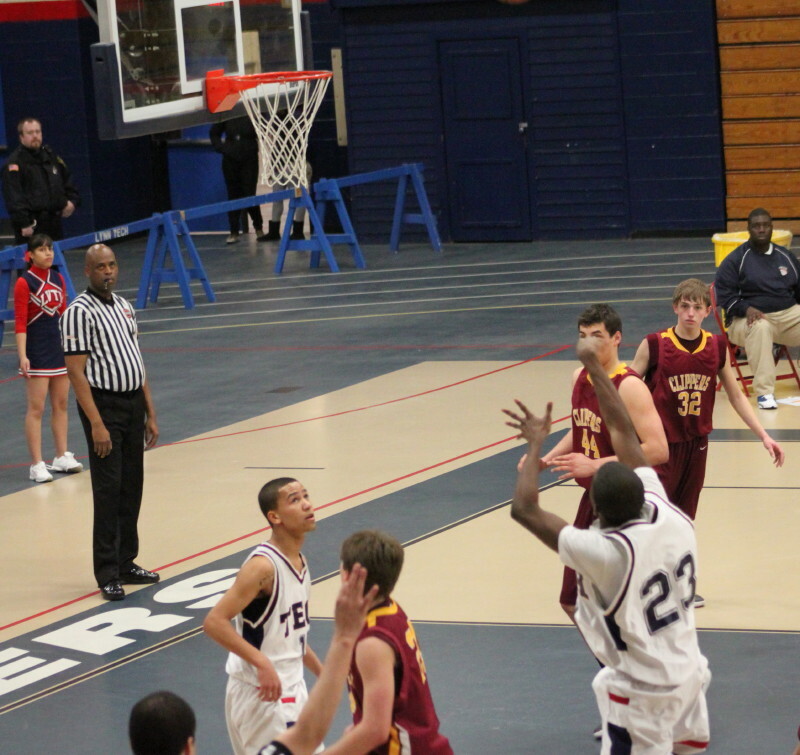 Chris Jayne made one of two free throws to keep the Clippers ahead, 73-69, with 16.6 seconds left. 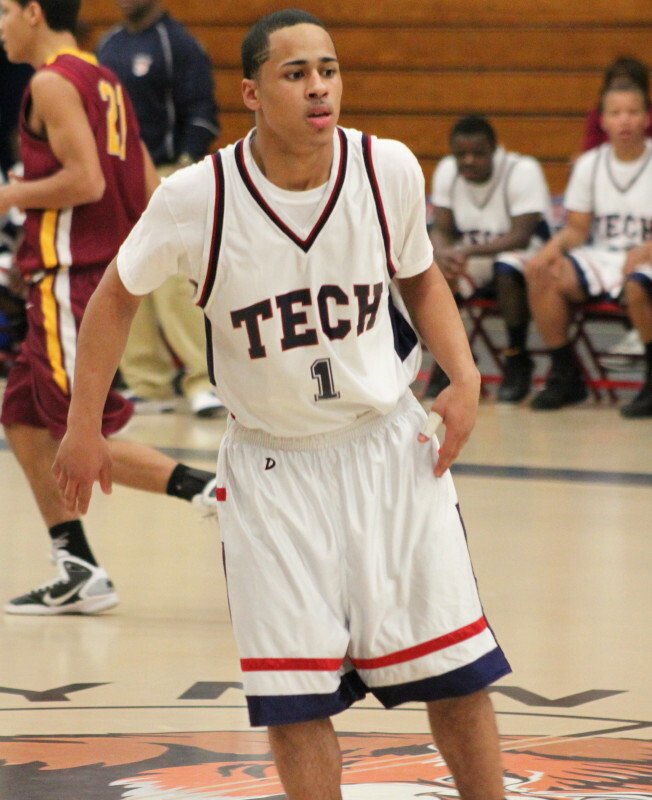 Michael Duarte took a long three that was well short but freshman Ronnie Williams alertly caught the air ball and laid it in with 4.5 seconds left and Lynn Tech trailed by only two, 73-71. Chris Jayne was fouled again and made the second of two free throws to put the Clippers up by three (74-71) with 3.8 seconds to go. Michael Duarte’s toss from the backcourt was well short causing normal breathing to return to a good collection of Newburyport fans. There were thirteen lead changes in this game. 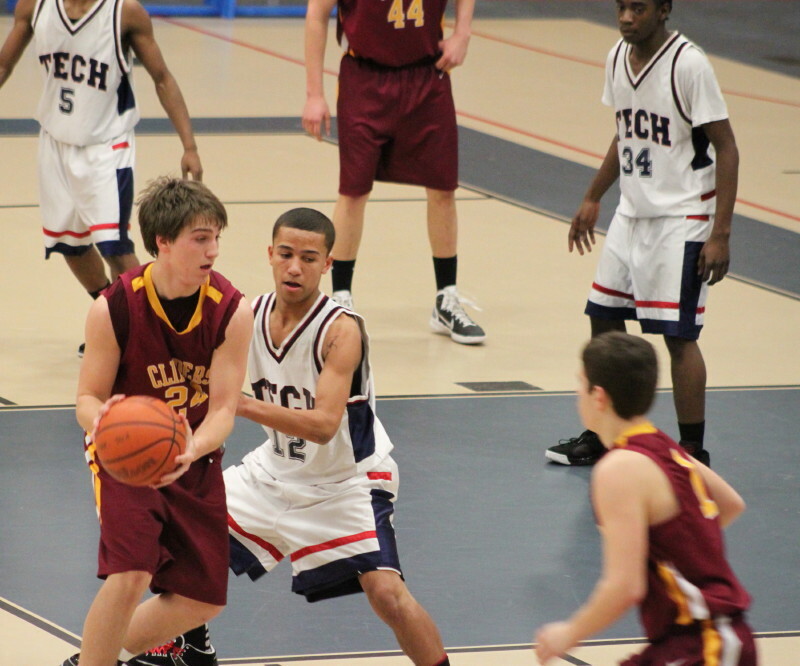 Trey Gallo (#1) takes the ball to the basket against Drew Carter. 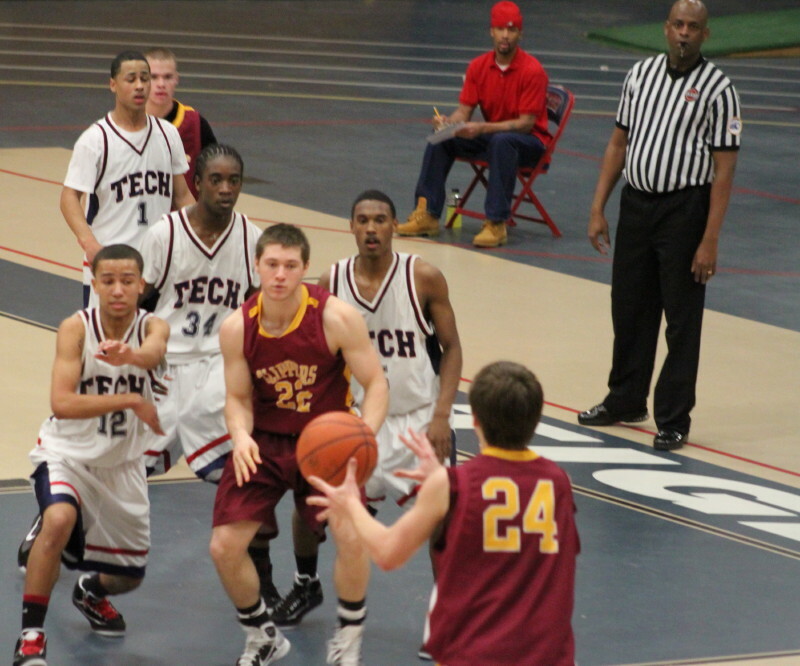 Lynn Tech (13-6/#4 seed) made their “go-it-alone” approach work on offense. There were numerous coast-to-coast drives ending in layups. In some cases the Clippers were back on defense but quick-moving Tigers like Trey Gallo (13 points) and Michael Duarte (12 points) could still weave their way to the rim. On the other hand, the Clippers (14-7) were willing to make passes to get open shots and did it ever pay off. 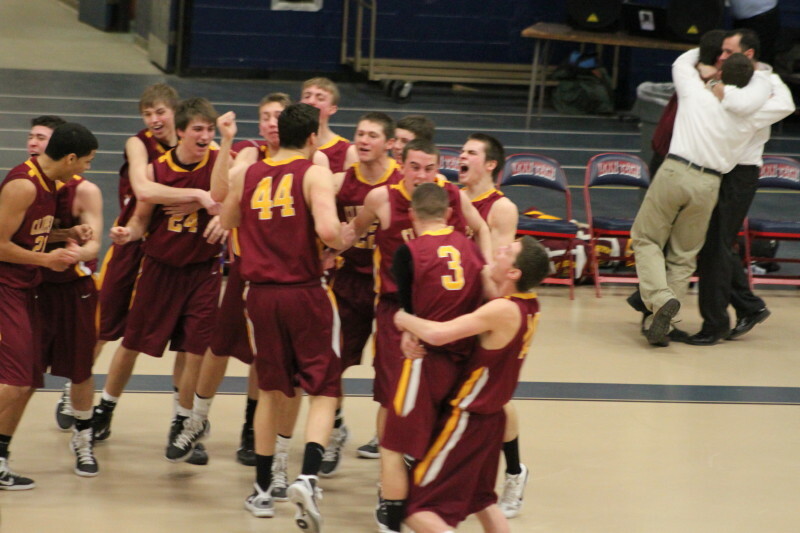 Newburyport shot a sizzling 56% for the game (25-for-44) including an unreal 67% (12-for-18) in the second half. Add 14-for-18 from the foul line (also in the second half) and you can see how good the Clipper shooting was in this tourney win. 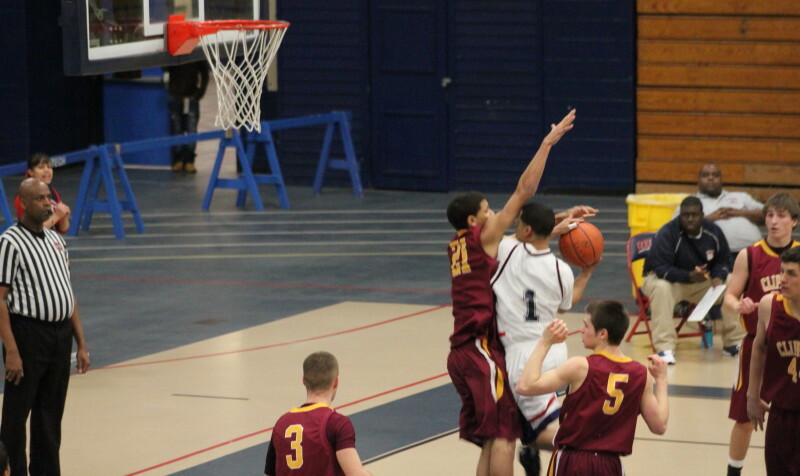 A last-second three by Matt Leavitt (13 points) gave Newburyport an 18-15 lead after one quarter. Luis Tavares (4 points) converted an offensive rebound with two seconds left in the second quarter to give the Tigers a 34-33 halftime edge. Rich Warren’s last-second three tied the score at 52-52 at the end of three quarters. So when you add on the way the last quarter ended you can see that the exciting moments just kept coming. Eric Meyer (19 points), Brett Fontaine (15 points), and Matt Leavitt and Chris Jayne with 13 points each, topped the Clipper scorers. 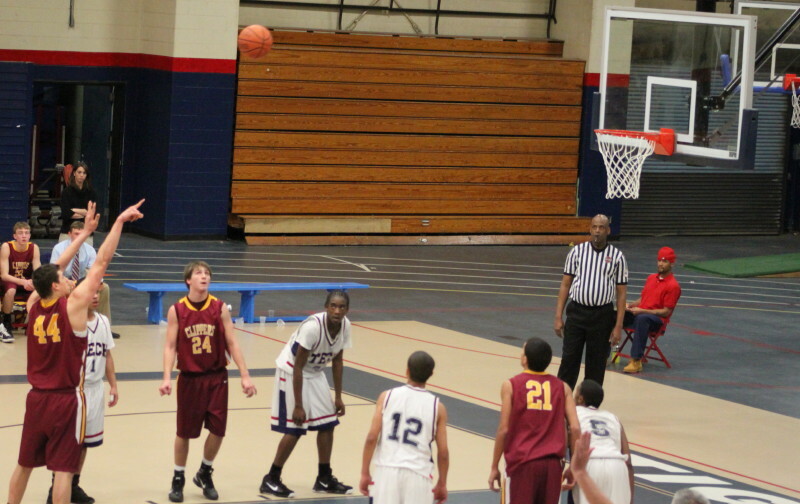 Brett Fontaine (#24) lines up a three after getting a pass from Matt Mottola (#22). 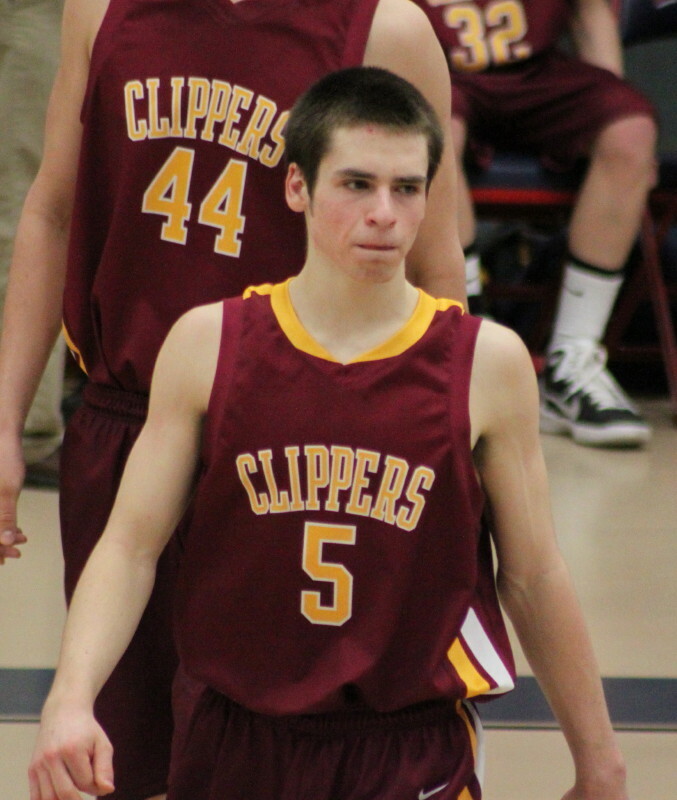 One of the big final-quarter plays for Newburyport was Matt Mottala finding Brett Fontaine for a three that gave the Clippers a 61-55 lead with five minutes left. #5 seed Newburyport now awaits the winner of the Pentucket at Hamilton-Wenham game tomorrow night. During the regular season the Clippers split with Pentucket and lost by five to Hamilton-Wenham. There were players from HW in the audience tonight. Tiger coach Marvin Avery has coached Lynn Tech for twelve seasons. His teams have reached the post-season every year and have been to the Division 3 North finals six times. It might not be so easy next season as the players he calls, “The Little Three,” (Trey Gallo, Michael Duarte, and Rich Warren) are all graduating.